Rodes Less Traveled podcast with Joe Cox! Every now and then, co-author Joe Cox and I participate in a mildly successful podcast. We talk sports, literature, music and pop culture. Sometimes we even agree on stuff. Back in 1998, we met across the hall at Rodes-Harlin Hall at WKU. Hence, Rodes Less Traveled. Take a stroll with us down the Rodes . . .
Ryan & Joe in Owensboro with guest Jarrod McCarty. We talk hoops and football and all the miscellaneous stuff that goes with it. Joe and Ryan podcast on the heels of the Southern Kentucky Book Fest. They discuss UK’s returning players and the 2014-15 team, as well as the Book Fest, books, baseball, barbecue, and probably other things that start with the letter “b”. Who knows. Joe and Ryan return to talk about the NCAA Tournament. Get our picks, our sleepers, and speculations on whether Embid’s Back would be a good band name, as well as a list of stereotypes that are applied to white basketball players. It’s fun for the whole family and it’s March-tastic. Rodes Less Travelled podcast by Joe Cox and Ryan Clark. 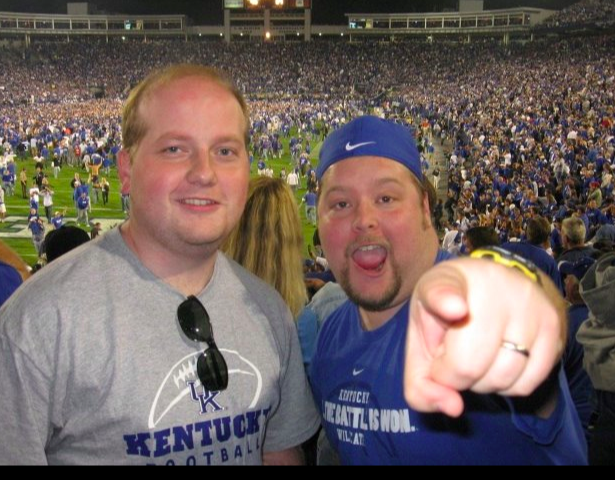 Joe and Ryan are long-time friends and co-authors who will talk everything from sports (mostly with a Kentucky slant) to books and movies to underrated musicians. In the first episode, Joe and Ryan talk about the upcoming 2014 NCAA Tournament and what they’ve been reading lately. Check back for more episodes!